The Certified Local Government (CLG) program is a partnership between local, state and federal governments focused on promoting historic preservation. The Kansas Historical Society and the National Park Service (NPS) jointly administer the CLG program in Kansas. Why should a local community become a CLG? 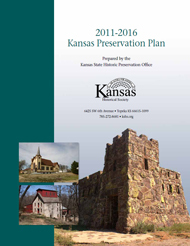 Certification provides expert technical advice from the Kansas Historical Society and the NPS. Partnerships with the National Alliance of Preservation Commissions, Preserve America, the National Trust for Historic Preservation and the National Main Street Center provide additional opportunities for CLGs to access resources. Access to federal funding is another benefit, making certified communities able to access the portion of federal funds set aside by each State Historic Preservation Office for just CLGs annually. Being a CLG also shows your community's commitment to keeping significant community resources from the past for future generations. Becoming a certified town, city, or county government demonstrate a readiness to take on a preservation project and be successful when seeking other opportunities for community development. Documenting our historic resources is essential to understanding our past. Learn how to participate in our online database.